As with any great landscape, the first step was establish a design. We first met with the clients in fall of 2014 and spent the winter planning out the yard. The clients gave us direction as to the various elements they wanted incorporated. From there we were able to collaborate and develop a 2D design. After many months at the drawing board we were set to begin the project in 2015, starting with grading and hardscaping. Initially, this was to be a phased project over 2 years. Firstly, we would do the hardscaping in phase 1 followed by the softscaping in phase 2. However, the client was so pleased with the result that we are currently on phase 4 with no end in sight. The client loves adding different elements to their yard year after year. And, as a result, I don’t think this project will ever be fully done. In 2015, we arrive to a muddy yard that was to be our canvas. We began grading and sculpting the muddy yard. 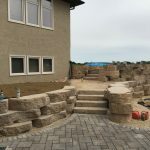 Furthermore, we established all the heights and slopes for our patios and retaining walls. This is a fundamental component because it determines how water will run off. After prepping the bases we installed most of the hardscaping elements. 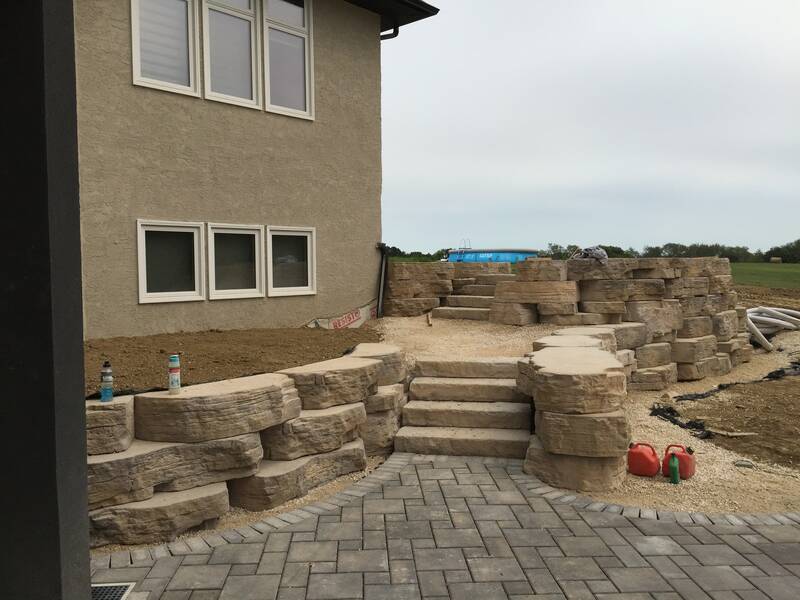 The hardscapes included patios, walkways, a fireplace, a fire pit, retaining walls and staircases using various Barkman products. For the walkways, we used Grand Flagstone slabs set into a crushed black granite base. The walkways link all the outdoor living areas, running from the front of the home and wrapping around to the back yard. 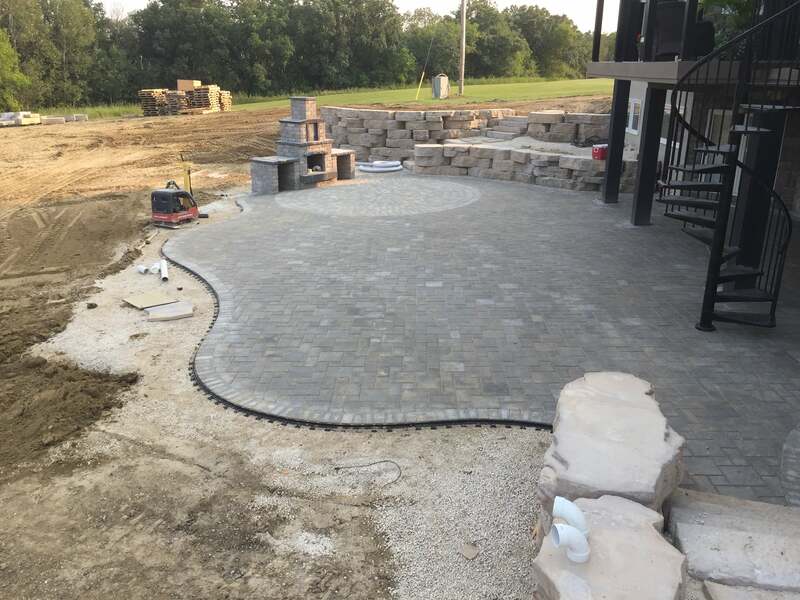 For the patios and seating areas, we mainly used Barkman Verano Pavers. And we incorporated a Roman Circle kit to specifically define the fireplace area. 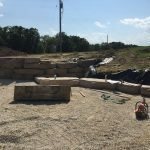 Due to the grandiosity of the house and we had to determine the best retaining wall product to use. 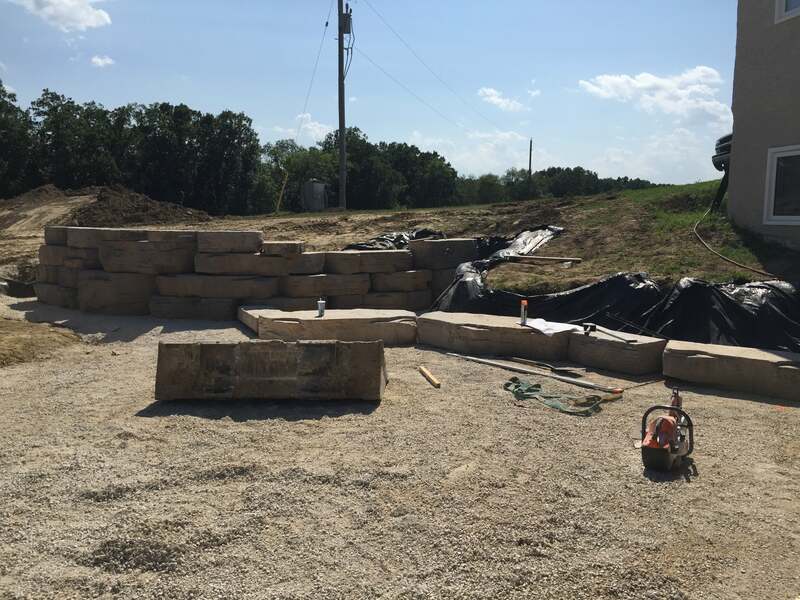 So, we decided to use Rosetta Outcropping because it is easily the largest retaining wall unit and had a rustic feel. Originally, the plan was to complete the softscaping in 2016. 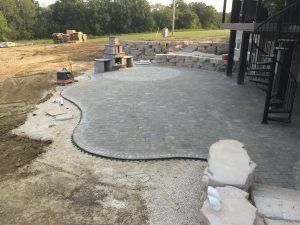 However, the plans were changed because the client wanted to add more hardscapes by incorporating a sunken hot tub area. The challenge was to make it look like it was always planned instead of an after thought. To achieve this, we enclosed the hot tub with Rosetta Outcropping stone with large dimensional steps leading up to it. 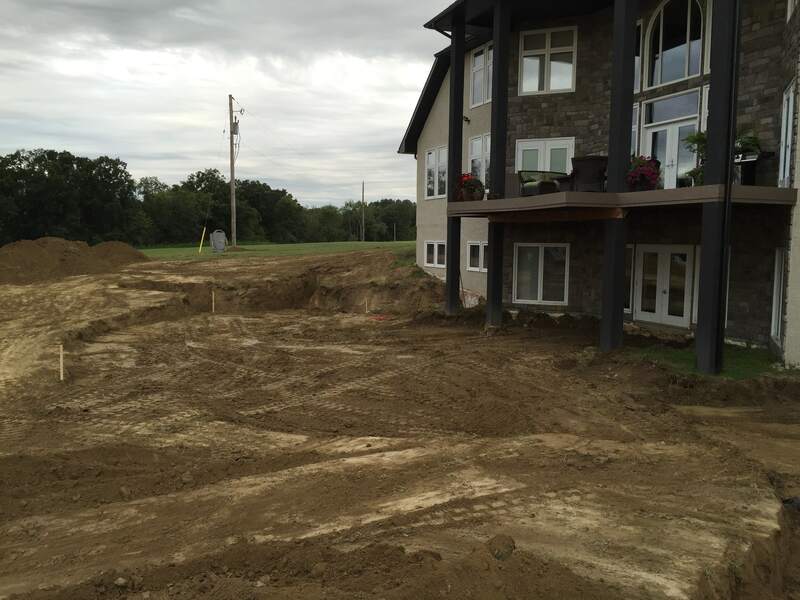 Due to the hot tub area being sunk into the ground 16 inches, we poured a concrete pad with a rain drain. It was piped to the back of the yard, so any water had a place to run off to. Another consideration in the design was that the hot tub needed maintenance access on one side. To achieve that we built a surround out of composite decking with a removable panel. Although this may sound simple enough, it was difficult to seamlessly tie into the walls built the previous year. 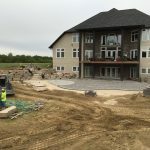 I must confess that I was a little nervous when we first started this phase but once it was complete, it was one of the nicest elements Silver Stone Landscaping has ever incorporated. As gorgeous as the hot tub area was, it wasn’t finished yet. The client wanted a water feature and seating area just off the hot tub surround. 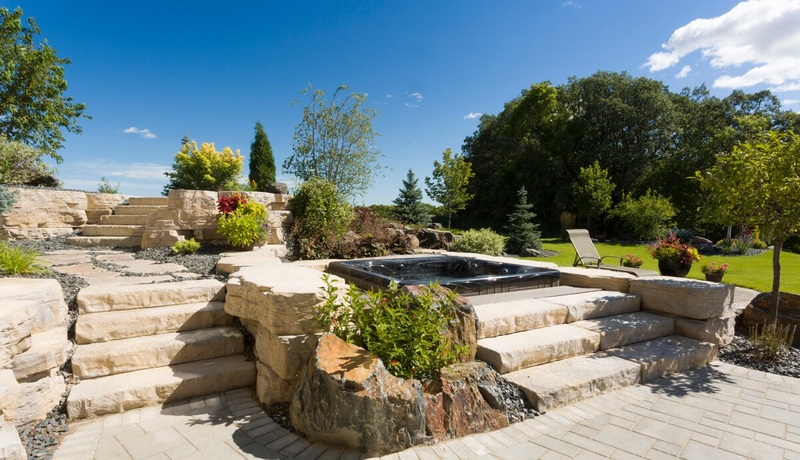 The water feature was built using rusty granite boulders reminiscent of stone you would see in the Whiteshell or Kenora area. The water splits into two streams and spills down a 6’ grade change creating sounds of flowing and splashing water that can be enjoyed from anywhere in the yard. After the hot tub area was completed, it was now time to get back on track and finish the softscapes. For those not familiar with this term, it simply refers anything that is fluid and changes over time such as trees and shrubs. To achieve a naturalized look we added varieties of spruce, cedar, and deciduous trees such as amur cherry, linden, flowering crab, lilac, maple, birch, and pine. In and amongst the trees we planted 150 different shrubs, perennials and grasses. These were all selected to ensure colour and texture all year round. 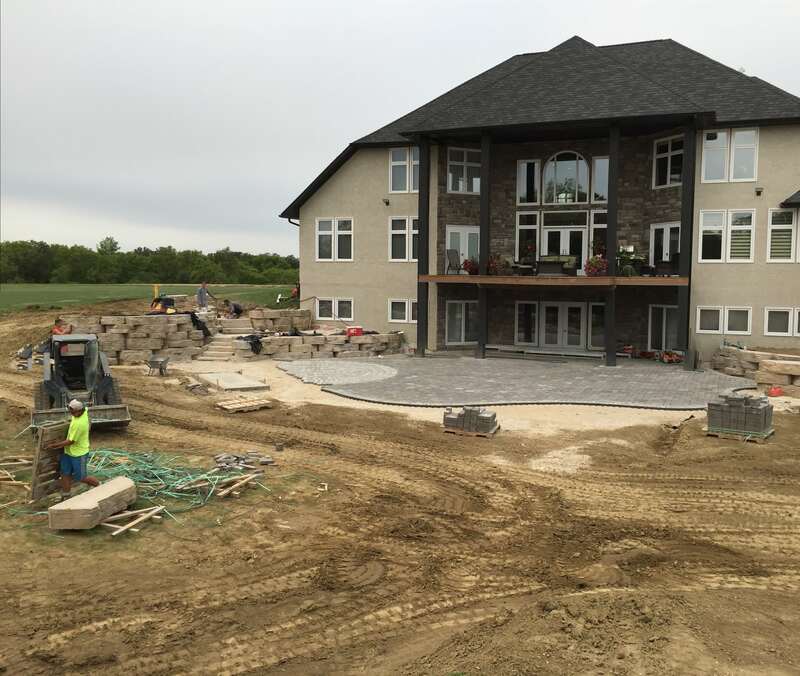 Several semi loads of black granite boulders were incorporated to add to the rustic feel. There’s a substantial amount of lawn that serves to anchor the yard, and an irrigation system keeps it healthy. The vegetation is gorgeous and will only continue to add to the yards beauty as they begin to grow and flourish. Other elements were incorporated as well. A large wood pergola above the main patio area was built to make a grand entranceway to the spectacular yard from the basement. Extensive landscape lighting was installed to create nighttime ambience and helps extend the family’s enjoyment of their yard into the evening hours. This is the ideal landscape as it offers the perfect balance of hardscapes and softscapes. In 2017 we added 40 lilacs that surround the entire backyard to give the landscaped area more of an enclosed feel. We also poured 1100 linear feet of concrete curbing to outline the driveway and give it a clean look. We are now heading into the 2018 season and are planning to add even more to this landscape. 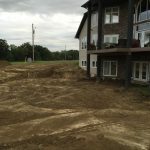 We are primarily concentrating on the front yard by adding feature berms and trees along the driveway. This will add to the curb appeal as you drive up to the house and also acts like an appetizer for the backyard oasis. There are also plans to add an outdoor kitchen and perhaps a water feature in the front yard in the coming years. I have always said that no landscape is ever truly complete. It’s almost its own living entity changing and developing over time. Its really have been a privilege to get the opportunity to work on such a gorgeous yard and we are looking forward to continuing to develop this landscape in the years to come.